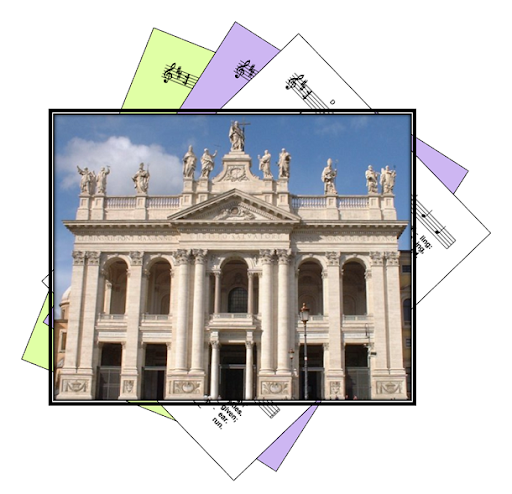 A selection of hymns and songs, based on themes from the Roman Catholic lectionary for the feast of the Dedication of the Lateran Basilica (9 November 2014) - and the general themes associated with the dedication of a church. The Lateran Basilica, is also known as the Basilica of St. John Lateran, the Church of Holy Saviour and the Church of St. John Baptist. It is the cathedral of Rome, ie the Pope's cathedral, and is where Christians were baptised in ancient Rome. This feast is a celebration in honour of the church which is "the mother and mistress of all churches of Rome and the world" and is a sign of love for, and union with, the See of Peter. It is on the site of the “mother church”, which was a large hall on the Lateran Hill that the Emperor Constantine donated to the church and dedicated under the title “Church of Our Saviour.” Later, this was replaced with a church dedicated to St. John the Baptist, and commonly known as St. John Lateran. First: Ezekiel - The prophet describes the river of water coming from the Temple, growing in size and bringing life wherever it goes. Psalm 45 - The waters of a river give joy to God's city, the holy place where the Most High dwells / God is for us a refuge and strength / The waters of a river give joy to God's city / The Lord of hosts is with us. Second: I Paul - The temple of God is sacred, and you are that temple. Gospel: John 2 - Jesus drives the money lenders and traders our from the Temple - and speaks to the Pharisees drawing the parallel between his crucifixion and rebuilding in three days, and the reconstruction of the temple. Faithfulness to the Pope, Christ the High Priest, the temple, Religious freedom. Gathering of God's people to form the Church. Baptism.